For once, Tottenham Hotspur look like they’re going to beat north London rivals Arsenal. 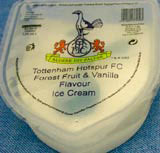 The White Hart Lane contingency are in for a real treat next season with the introduction of Tottenham Hotspur Ice Cream. More importantly, it’ll go on sale three weeks before Arsenal’s own version. The product, designed by ice cream maker Eat, has a fruits of the forest-flavoured blue club badge running through the tub of vanilla ice cream. 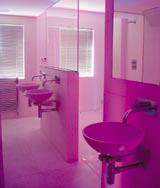 Ice cool – unlike Spurs’ defence.